We figure you won't be spending much time inside, given what lies outside your door. But when you do, we think you'll find both the Orchard Apartment and Cider Apartment to be inviting and accomodating. They are available from June 1 through the last Sunday in October. Each is air conditioned, tastefully furnished, and has its own private deck overlooking the orchard and Cove. For weddings, they are included for the night of the reception. Stay for a night, a weekend, or as long as it suits you. You'll be hard pressed to run out of things to do. 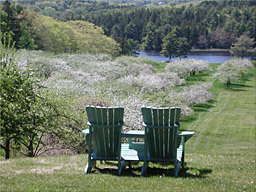 Rates for either the Orchard or Cider apartment are $135/night and $810/week (+ 7% state sales tax).